How much can I have to drink? When can the police breathalyse me? What happens if the police are going to breathalyse me? If I am charged what happens? Can I drive between being released from the police station and going to court? Should I see a solicitor before going to court? What penalties can the court impose for drink driving? How does the court decide what penalty to impose? Can I ask to get my licence back before the end of the ban? Road traffic law is complicated – here is a general guide to help you understand some of the basics and concepts involved. 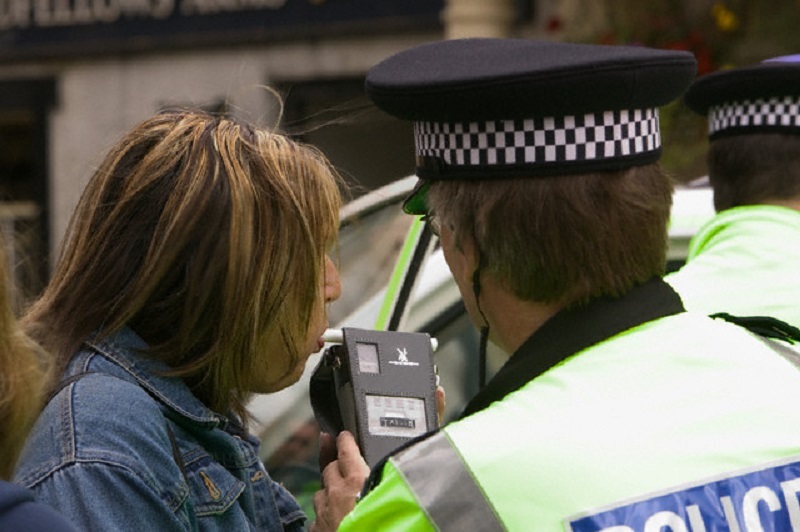 What are the Drink Drive limits in Scotland? As of 5th December 2014 the drink driving limits in Scotland have been reduced. 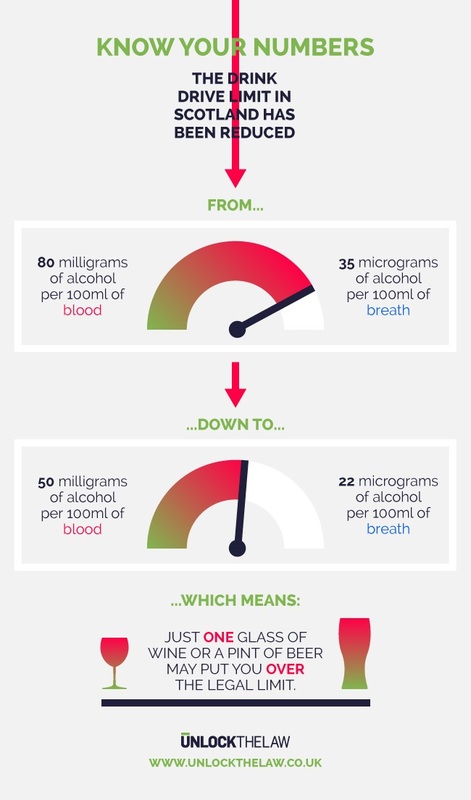 Before the change if a person was breathalysed the limit was 35 micrograms of alcohol per 100 millilitres of breath – that figure has now been reduced to 22 micrograms per 100 ml. Blood samples are sometimes taken instead of breath and for such readings the limit was 80 milligrams of alcohol per 100 millilitres of blood – that figure has now been reduced to 50 milligrams per 100 ml. How much can I have to drink now before driving? This is a question that is repeatedly asked and the only safe answer to provide is to say that no alcohol should be taken before choosing to drive. Before the limits were reduced many people would consider themselves safe to drive after having for example a pint of lager /beer or a glass of wine. With the new limits being considerably lower it must be said that almost any alcohol being taken is likely to place a person in danger of losing their driving licence through a drink driving prosecution. Remember also that many breath tests will take place in the morning after people have been perhaps drinking more heavily on a night out or at home – the same limits apply no matter the time of day and the safe advice is that you should leave considerable time between drinking and getting behind the wheel, even the next day. The reality is that the police have extensive powers to breathalyse drivers. Any driver who has committed any moving road traffic offence – from driving without a seatbelt, or using a mobile phone to more serious offences such as dangerous driving – can be requested to provide a breath sample. Also any driver who has been involved in an accident or whom the police suspect has been drinking or taking drugs will be asked to provide a breath sample. Can I choose to refuse to provide a breath sample? The short answer is no – when the police make a request of a driver to provide a sample for the reasons outlined above then failing to provide a breath sample will lead to you being charged with a separate offence of failing to provide a breath sample without reasonable excuse. Sometimes drivers think they are entitled to refuse to provide a breath sample because they perhaps haven't been drinking at all or feel that they will pass the test anyway and don't need to comply – this is not the case. If you find yourself in a situation where the police are requesting a breath sample you will initially be asked to comply with a "roadside "breath test. This procedure in fact takes place within the police car and you will be tested on a handheld device. This device is quite basic and simply advises the police whether you have passed or failed the test. If you have passed the test you will be allowed to go on your way, resume driving and obviously there would be no drink driving charge made against you. If however you fail the test you would then be arrested and taken to the nearest police station where more sophisticated testing machines are available. At the police station you will be required to provide two breath samples and readings will be recorded. It is possible to pass this test at the police station despite having failed the roadside test. Usually though the test at the police station is also failed, and at this point you would be charged with the drink driving offence – the lower of the two readings provided is used as the figure for prosecution. What happens when I have been charged? You would be processed at the police station including your photograph, fingerprints and DNA being taken. The norm is that after a number of hours in a cell - and clearly once there is no prospect of you still being over the drink drive limit – you will be released from police custody having being processed through what is known as the "bail undertaking "procedure. This is a procedure where you are placed on to bail by the police to attend court on a specified date which is usually within a few weeks from the date of arrest. If you fail to attend court on that date you would then face prosecution not only for the drink driving charge but also a separate offence relating to not attending court on the agreed date. For people who have previous convictions there is the likelihood that they will not be released on a bail undertaking but rather will be kept in police custody to appear before the court on the next lawful day . Yes – there is a presumption of innocence in Scots law which means that you can drive normally until the case has been dealt with by the court. The only exception would be where the police impose a special condition of bail prohibiting you from driving although this is unlikely. This is a matter of personal choice – for many people the reassurance that comes from speaking to a solicitor who knows and can explain what is likely to happen is of great benefit. Instructing your own solicitor will help you understand what is happening and prepare you for the court procedure that lies ahead. If you are going to plead guilty to the charge the solicitor can assist with preparation of relevant information to present to the court which will explain why the offence came about, the impact of the case and loss of your licence upon you, your family and your employment. This information will be presented to the court in the form of a "plea in mitigation "conducted by your solicitor on your behalf and should impact on the punishment that is imposed. Equally you may have a defence to the charge and your solicitor will know the law and be able to advise you about that. Also having your own solicitor at court means that you will be better informed about what is happening. Legal aid may be available to cover the legal fees of the solicitor. If you elect not to instruct your own solicitor then you will on the day of the bail undertaking be given the opportunity to get advice from the "duty solicitor "on a free of charge basis. The duty solicitor may require though to represent a significant number of people. On the day of your court appearance you should arrive well in advance of the time of the bail undertaking – it is better to arrive early than to be late as a warrant will usually be issued for your arrest if you are not present when your case calls. You should attend with your driving licence, both the card and paper part. On arriving at court you will be directed to the relevant court room and a police officer will serve a citation upon you – basically you will be given paperwork which will include your name and address, the details of the charge you are facing along with a basic summary of the evidence against you. You should provide this to the solicitor who is going to represent you – although you can obviously represent yourself should you wish to do so. The solicitor will consider the paperwork, advise you and then receive your instructions to plead either guilty or not guilty. If you plead guilty to the charge the court will normally proceed to deal with the charge on that day. If you plead not guilty future dates will be fixed for you to re-attend court, a trial date and also a hearing usually held a few weeks beforehand called an intermediate diet. An intermediate diet is a pre-trial hearing to ensure that both the prosecutor and your solicitor are prepared for trial if one is to take place. If you are pleading not guilty the issue of bail will be discussed in court and if you are granted bail (which is the norm for people without previous convictions) then you would also be able to continue to drive until the trial has taken place, unless specifically advised by the court that you are not allowed to do so. In Scotland a drink driving offence brings an automatic "mandatory "minimum 12 month disqualification from driving. A fine is routinely also imposed by the court and this can be up to £5000 although the norm is for fines to be usually less than £1000. Time to pay the fine is usually allowed and instalments are then paid on a regular basis to the Clerk of Court. The court can also impose a period of imprisonment and this is a possibility for those people who have previously committed similar drink driving or road traffic offences. Forfeiture and destruction of the motor vehicle involved in the offence can also be imposed, again normally for repeat offenders but also for first offenders where the drink drive reading was particularly high. Multiple factors though influence the sentence imposed by the court and a solicitor should present all of the relevant factors to the court in a carefully constructed plea in mitigation. It may be possible also to ask the court for a place on a Drink Drivers Rehabilitation Programme which is available in some courts – if completed this can reduce the disqualification by a number of months. It is not possible to request to go on such a course after the court hearing so your lawyer should suggest this to the court at the sentencing hearing, if appropriate. Disqualification when imposed is immediate and you should not drive to court as you will not be able to drive home after the hearing. There is a procedure to ask the court for early removal of a disqualification. A certain proportion of the ban must be served before such a request can be made and you should ask your lawyer or the Clerk of court if you are in a position to make such an application. A full court hearing is then held and normally to be successful there must have been a significant change in your circumstances or a clear benefit to others or the community in general – the courts do not reduce periods of disqualification for no good reason. This guide is provided as an outline of the procedures relating to drink driving offences in Scotland. It is a general guide and should not be relied upon as legal advice. If you require specific legal advice in relation to a drink driving offence or bail undertaking for any court in Scotland please call 01415529193 for some free initial advice.